Gilbert Allen is the author of five collections of poems, including Driving to Distraction (Orchises, 2003), which was featured on The Writer’s Almanac and Verse Daily. Some of his newest poems and stories have appeared in Able Muse, Appalachian Heritage, Appalachian Journal, Flyway, Measure, Sewanee Theological Review, The South Carolina Review, and The Southern Review. 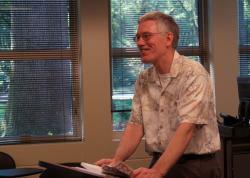 He is the Bennette E. Geer Professor of Literature at Furman University. I saw Melvin Wood, The Tree Man, in Mall Mart while I was buying travel size toiletries for my upcoming Cruise to Nowhere. To keep him from seeing me, I turned to the Athletics Cosmetics display, where a holographic image of Amy Knobloch hovered above the four words that had made her famous. Her penalty kick had won the gold medal game at the last Olympics. She was a local girl, a mass marketer’s dream—an amputee who’d become a world class athlete and a semifinalist on Pole Dancing with the Stars. Marjorie, my wife, had loved her. At the product launch, she’d lined up for an hour to get Amy’s autograph on a giant bottle of shampoo. I told him I’d be driving to Charleston tomorrow morning to begin a five-day Caribbean cruise. I didn’t say anything about my Hermetic Vacation package. Melvin had worked outdoors all his life. “My tree still doing?” He pronounced it dune. Right after I met Melvin on jury duty, ten years ago, he’d come out to Belladonna to prune a big pin oak—the one the Owners’ Association swore couldn’t be saved. Melvin always referred to it as “his” tree. “Healthy as ever,” I said. No way out of that one. Since I’d been working at my insurance agency on that long-ago weekend, Marjorie had greeted Melvin in the driveway. When he’d told her that the oak didn’t have to come down, that he hated to kill a live tree, that it was like killing one of his own kids (which he didn’t have), Marjorie knew she’d found a kindred spirit. After he’d spent a whole day with a hand saw and a bucket of tar for the open wounds, she’d run into him, maybe every other month or so, while she was out grocery shopping. He’d always ask her for an update on “his” tree. But I wasn’t in any mood to be consoled. I put the roses through the Disposall, dropped GWT Uterus and the mattress voucher into the garbage can, and carried the sheet cake into the powder room. I cut it up into cowflop-size pieces and started counting. By the last flush, Satan was up by a touchdown and an extra point. When I opened the bathroom closet to get something to scour the rim of the bowl, I saw one of Marjorie’s Post-Its stuck to the inside of the door. And then I remembered that the Cruise to Nowhere she’d planned—and paid for— would set sail in a week. Marjorie was quoting Amy Knobloch to me, even from the grave, because I’d been an insurance man all my working life. We’d never taken a cruise before, and I hate to leave Greenville, so she’d refused to buy TravelGuard. “Three drops of rain on the windshield and you’ll cancel, Baron. I know you. That’s why I booked with Peregrine.” She led me by the hand to her laptop computer and showed me the itinerary for the Cruise to Nowhere. Every day was a FUN DAY AT SEA. “With the Hermetic Vacation package, you’ll never have to step outside,” she said. I looked at the web page more carefully: No ports of call, all-indoor amenities, the same table for every dinner, the same cabin every night. Same bathroom, same bed, same pillow. Peregrine even had its own underground parking garage in Charleston, with an umbilical cord leading directly to the ship. I had to admit that it sounded pretty good. Risk free. I mean, how could I object to Nowhere? “When did she die?” the young woman asked. “Three weeks ago,” I said. “I’m a psychology major,” she said. For some reason, I told her I’d majored in history. And it didn’t. It was company policy. He said Peregrine couldn’t possibly fill my cabin five days before a Cruise to Nowhere. “Even if we—even if you— could find an emergency replacement, there’d be no time for Homeland Security prescreening.” But he did assure me that I’d have special handling once I was on board. Special handling. So, by God, I was going Nowhere whether I liked it or not. After I slammed down the phone—one of the great advantages of a land line—I saw Marjorie’s oldest, most crinkly Post-It next to our list of emergency numbers. I found a fresh Post-It packet and peeled off a new one of my own. Special handling would have a new meaning in the near future. I took out my wallet to give him a tip. My problem was with the company, not with the staff. “Let me take that vase,” he said. Except for the maze of yellow crime tape to keep us all moving in the right direction, it was like standing in the infield at Darlington or Daytona. Virtual Fords and Chevvies were racing on the skin of the inner walls, their advertising logos stretched to DayGlo blurs—although the sound was muted, so we could hear any emergency directives from Homeland Security. It was real enough to make you throw up, and the guy in the Jeff Gordon cap in front of me did. Fortunately, the Peregrine staff had issued recyclable barf bags at the door. When I started to get dizzy, I held Marjorie in one hand while I studied my Yphone map of the Peregrine Windhover. The crew lived on Deck Zero. The umbilical would lead us directly to Sensorama, one of the main decks. The other one, Panorama, had duty-free shopping and outdoor access. There were four residence decks. Circe, for guys who like to party hearty. Medea, for the families with kids. I’d be on Tithonus, Deck Five—right below Narcissus, the top deck, with UV-resistant skylights and personal size pools for the young singles. Then a pop-up ad interrupted my Map App. Peregrine—All who wander are not lost. I couldn’t get rid of the damn thing. I had to turn off my phone. “That’s not a person,” GRACIE sputtered. My carryon was waiting for me at my cabin, with a special consideration bracelet that entitled me to unlimited free drinks—and to senior singles dining, rather than Tithonus for Two. After I unpacked, I tucked Marjorie into the closet across from the bathroom door. She always seemed to like closets, especially when she felt hopelessly, helplessly mad at something. Room service brought me a bottle of champagne, which I promptly popped and poured down the toilet. After I flushed forty-five times, I ran both the sink and the shower full force in the tiny bathroom. Sitting on the edge of the king size bed, I could imagine I was living next to a pair of malfunctioning deepwater drilling rigs—the Peregrine spills, draining the Peregrine corporate coffers! Compensation! Then I settled down for a nap before dinner. On the Tithonus Deck, you really couldn’t tell if the ship was moving. The virtual window in my cabin had no curtains, just a remote control. I had always assumed that the Cruise to Nowhere went somewhere, if only in circles, but maybe the Windhover could wallow in port and save fuel. At some point, I’d have to go to the Panorama Deck and step outside, to see if we’d actually left the harbor. I was a late arrival at senior singles. They’d put me at a round table for eight, with plenty of room for wide bodies and wheelchair access. JIMSKI had already taken orders for appetizers, and he handed me an ivory menu right away, so I could catch up. I told him I wanted two. “Which?” He pronounced it to rhyme with beach. JIMSKI knitted his black, woolly eyebrows and led me to the maitre d’s station, where I flashed Marjorie’s BuyPass. After consulting his virtual manifest, the maitre d’ dragged a chair from a vacant table and begged my pardon. JIMSKI settled Marjorie into her seat and propped a menu between her urn and the lacy hem of the tablecloth. By this time, all the appetizers had arrived, but no one was left to eat them—except for one woman, on the far side of the table. She looked like Jackie Kennedy before she got cancer. Only with curly hair. With her left cheek angled in my direction, she was giving me a smirk that could’ve been Photoshopped from the Mona Lisa. I looked down at my menu and said, “My wife and I will be having the lobster bisque.” JIMSKI leaned in towards my ear, then pointed to the urn. “Does she tip?” He pronounced it to rhyme with sheep. Jackie Kennedy was still halfway smiling, but she hadn’t said a word. At 7:30 A.M. I called room service for a full American breakfast. Everything but my bagel and black coffee got flushed. After I turned off the sink and the shower, which I’d kept running all night—I didn’t want my towel steward getting suspicious—I took the elevator down to Sensorama. The videos hadn’t started yet. Our cruise director, RYAN01, stood center stage, spotlighted, in the middle of his introductory spiel. It was enough to make me nostalgic for Barack Obama. When the lights dimmed, we were docking in Ocho Rios. The deep blue harbor shimmered in the dawn sun, without an oil slick in sight. Green hills beckoned in the distance. On the cab ride to Prospect Plantation, a legless beggar waved at us from the curb. When he opened his mouth to speak, half of his front teeth were missing. At the plantation, we took a jitney ride through sugar cane, pineapples, and banana trees. When the dirt road began to get rougher, my seat began to shake. “That is what we call the Jamaican massage!” said RUPERT, our digital tour guide. He wore loose tribal pants and no shirt. After he hopped down from the front of the jitney, we watched him climb a coconut tree. It slanted about thirty degrees from the perpendicular, so he could walk up with his bare feet while he wrapped his hands around the other side of the trunk and leaned back, straight as a telephone pole, extending his black arms. The ride back to the harbor featured a terrorist ambush and three IEDs. At that point, I gave up on Sensorama. Two college kids from the Circe Deck were slouching next to the open door, swilling beer, even though it wasn’t even 10 A.M. yet. Their Peregrine specialty T-shirts read DRINK, PISS, REPEAT. I heard an enormous explosion behind me. Now she pointed to the FrankenShrimp on her plate, licked her glossy lips, and circled her other hand in front of the bodice of her black dress. While we were waiting for the crème brulée, she took a Yphone out of her tiny purse. To give her some privacy—how could she know I really didn’t speak Italian?—I stood up to go to the rest room. A moment later, my own phone began to trill. I turned back to my senior singles table and saw her Mona Lisa. She must have the Yphone Plus, with the proximity function and the Instant Translation App. “Okie-dokie,” I said. Now I spoke directly across the table, not into the Yphone. I didn’t think I should trust her software on this one. “Breed Love.” Her slight smile widened for the first time. portion as well as my own. When I finished, I said, “Where is the rest of our table?” Gabriella tilted her head and lifted the linen next to her water glass, baring the faux rosewood beneath. Then she shrugged, extending both open palms toward the ceiling. Except for Gabriella, every senior single I’d seen so far waddled around in flip-flops or sneakers. “Walruses don’t wear shoes,” I said. After dinner, I returned to my cabin to practice for Senior Karaoke. The Morning Memo to Our Most Seasoned Cruisers had included a list of the featured songs—“just in case the words changed since the last time you heard them!! !” I decided to pass on Margaritaville, Love Me Tender, When I’m 64, and My Heart Will Go On. I’d be performing Mister Lonely. I wrote out my customized lyrics on the backside of the Morning Memo. Because there were no A’s with guts enough to go up to the front of the Tithonus Lounge, Mister Baron Breedlove was performing first. A hundred geezers sat in the audience, half of them in wheelchairs. There was one kid, in her twenties maybe, with the biggest incisors I’d ever seen. I figured she was somebody’s granddaughter. The DJ handed me a cordless mic and asked me if I wanted to increase the font size of Bobby Vinton’s lyrics on the teleprompter. I spent most of the next day on the Promenade Deck. It would’ve been the perfect vacation for Marjorie—almost as big as Mall Mart, but with exotic specialty stores and no groceries to worry about. I tried to find the jewelry boutique on my own, since I hate to ask for directions, but I finally had to go to a kiosk for a shopping consultant. “I’m looking for a forty-fifth anniversary present,” I said. “We keep the good stuff in back.” She offered her bony elbow and waited for me to take it. “For a more personalized experience.” Then she escorted me to a door marked AUTHORIZED SHOPPERS ONLY. She was leading me past illuminated display cases of designer watches, wedding rings, engagement rings, earrings, toe rings, nose rings, navel rings, charm bracelets, pendants, and pins. “I don’t see any Porsches,” I said. I told her I wanted a nice necklace for my wife. Nothing but the best. That she deserved a nice surprise, for a change. I asked her to show me both. I couldn’t tell them apart. I told her my name was Baron. “Not tonight it isn’t.” She told me the usual gratuity on high end jewelry was five percent— six, for exceptional service. “Well, I think you’re exceptional,” I said. After another Yphone dinner with Gabriella, I decided to take Marjorie down to the Promenade Deck. She would have wanted us to go outside at least once. The airlock loomed at the stern of the ship. NON-CLIMATE CONTROLLED AREA. UNSECURED PETROCHEMICAL VAPORS. The door was that gunmetal gray I’d seen on submarines in the movies. You had to insert your BuyPass over the handle and sign an electronic waiver before it’d budge. When it did, I was hit by a blast of hot, humid air that smelled like an old garage. The balcony was narrow, but it ran the whole width of the ship. The Windhover had indeed left Charleston harbor. While I stood at the railing and swiveled my head, horizon to horizon, I could see only open ocean. When I looked straight down, the ship’s wake was churning up white in the moonlight, with little rainbow flecks on the outer edges. I wondered if it was all water, but I inhaled deeply anyway. Marjorie would have wanted me to inhale. Marjorie had been adventurous. Not like me. After all those miscarriages, she would’ve been willing to try again—even though the doctors had told us she’d be taking a big chance. One summer, while she was off with her mother on a bed-and-breakfast tour of the Blue Ridge Mountains, I had a vasectomy. I never told her about it. But I knew if she’d been planning a vacation just for herself, she’d have done things differently. Marjorie always liked to take things into her own hands. If she hadn’t spoken to me first, at college, we’d never even have met. Years later, after she’d finally given up on the idea of having a family, I wondered whether she’d started hard-core couponing because she felt cheated—by everyone and everything around her. Because she was tired of paying and paying, because she wanted the world to give her something back, because she was trying to get even. And, by God, because she was damn good at it. I heard a gasping sob. When I spun around to face the airlock, the door was still latching. I took Marjorie back inside and used my BuyPass to check the log of electronic signatures. There wasn’t much to read. The only other name was Winifred Poogan. On the last evening of my Cruise to Nowhere, Gabriella brought Captain Caravaggio Cupisti to our dinner table. He was a tall man, neither young nor old, with the kind of slicked-back hair you only saw in the movies. Except for his missing cap, he was in full uniform, with gold braiding on his broad, padded shoulders. After she whispered some Italian into his ear, he said, “I am coming here, Baron Breedlove, to renew your wedding vows, and this lovely lady will assist me.” JIMSKI picked up Marjorie’s urn from its customary place at the table, and he handed it to Gabriella. While the wheelchairs and walkers gathered around us, Gabriella stood next to me, but she didn’t say a word. Up close she looked older than Marjorie, older than me, with an ancient scar on her cheek. But she was wearing white, and she had remarkable posture. And, at precisely the right moment, she gave me my bride, and she began the applause. Captain Caravaggio Cupisti shook my hand and said “Signore” before leaving. Since none of his names had six characters, I figured he didn’t expect to be tipped. I was so shocked to hear her speak English that I didn’t even ask her why not. When I loosened the drawstring of the pouch, I saw a pair of sterling silver earrings in the shape of tiny high-heeled shoes. We docked in Charleston the next morning, but there was a final breakfast— with open seating, in the Tithonus dining room—for anyone who didn’t have early travel connections. Marjorie wasn’t with me, and she wasn’t with my luggage, either, which I’d already entrusted to MARCUS. I’d decided to leave her—and her new necklace—in my cabin, facing the virtual window, with the Peregrine sticker from the jewelry box over the label from the crematorium. Marjorie had always wanted to travel. With any luck, the stewards would figure she was part of the room. I read somewhere that Peregrine made every cabin unique. And if anyone tried to take her from the Windhover, an electronic alarm would go off, and I’d be duly notified. I hadn’t yet decided whether I’d report the necklace as missing. 25K is a lot of money, but I had to admit I was feeling better than five days ago. SINGLE HANDED. NO EXCUSES. Maybe Amy Knobloch was right. JIMSKI brought out a simple Continental breakfast—one for me, and one for Marjorie. After spelling out his six-character ID—twice—he told me he was going on shore leave just as soon as he got out of his uniform. He wished me and my wife a good trip home. While I was sipping my coffee, a young woman asked if she could join me. She had the kind of face that would’ve looked adorable on a five-year-old but seemed faintly ridiculous on an adult. “I think they’ve stopped serving,” I said. While we were eating, she told me she’d been staying on the Narcissus Deck. “I never went up there,” I said. I’d seen those teeth before—at Senior Karaoke. “They are very—white,” I said. Now she started crying, with the racking, shoulder-wrenching sobs of a child. “Please stop that,” I said. “Please. Stop.” But she couldn’t. I started thinking about that self-made waterfall in my own cabin, five days’ worth of sopping towels, the urn I’d left behind. Marjorie would have wanted me to do something. To give her something. I couldn’t leave her like this. But she didn’t have six characters, and she couldn’t stop crying. So I finally reached into my pocket, and I took out Gabriella’s tiny shoes.